High end designer decor from Amy Lau for Kip's Bay House 2009 via pointclickhome.com. This photo really doesn't do the installation justice. Visit wallcovering firm Maya Romanoff to appreciate the achievement of Amy Lau and paper artist, Jo Lynn Alcorn or tour the townhouse now until Sunday, May 17th. 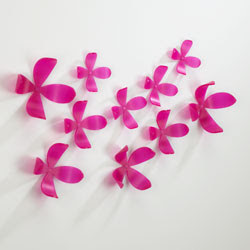 Wallflower Wall Decor from Umbra. 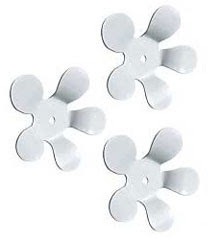 Available in pink, kiwi, white, and black $37 per set of 25 magnet mounted polypropylene flowers. This post was written as part of the Hooked on Houses blog fest. Julia is having a Grey Gardens obsession today. Grey Gardens is in the Hamptons on the south shore of Long Island, right at the other end of Suffolk County from Beach House but it's all Long Island, all the time.. I'm also upcycling it to Fifi Flowers Design Decor because it's the eco-friendly thing to do this week AND because she's drinking champagne in Champagne, France. All I can think about is the dust they will collect. I have not seen the 3D ones before...thanks for sharing. They look fabulous in the first photo... like Jenni mentioned, what about keeping them clean? Oh Jenni, I'm the duster in chief, wife is the sneezer in chief. There are some things I don't dust unless wifey is out of the state. These wallflowers are great but best left to a pro to dust. people, people, don't you think people who can afford handmade wallflowers have people to dust? What a FAB idea! And who cares about dust. Sometimes what is most fashionable requires a bit of work to maintain! THose white ones in the entry are FAB and FASHIONABLE for sure!!! PS I love that Petunia doesn't mine the dust... perhaps if I get them she will come dust them or at least send some help to do it for moi! Tee hee. If I had to worry about dust this much I wouldn't have dogs, cats, plants, curtains... or flowers for that matter. As an ignorant youth, I once rolled my eyes at my mother for commenting on how much dust some item or other would collect. She was to be pitied. It's all so different now. And still, that is a lovely wall. 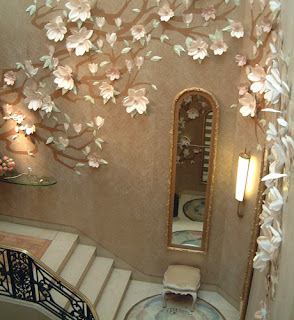 I once did something similar with eucalyptus leaves I'd painted gold and attached to a wall painted cobalt blue. It did get dusty but not unbearably so. I love the 3d aspect of the flowers. That looks fabulous, it is amazing what a few little creative touches here and there will do to make a house a home. Thanks for sharing.